The miracle never materialised. Barcelona came flying out of the blocks against Athletic Bilbao at Camp Nou on Monday night, but it was too little, too late from the Blaugrana. They were well beaten over two legs and not even Lionel Messi could save them this time. Messi lit up the final of the Copa del Rey in May with one of his greatest goals as he ran from the right flank, beat three men, cut inside past another and netted with a sublime finish inside the near post. But in this Supercopa series, he was well marshalled by the Basque defenders and unable to influence the game as he so often does. He was still involved. At San Mames on Friday, the Argentina attacker struggled for support in an experimental line-up but tested Gorka Iraizoz with a dangerous free-kick and a low shot from the edge of the area. And on Monday, he found himself crowded out by defenders every time he received the ball, pushed deep into the centre circle and firmly tackled. 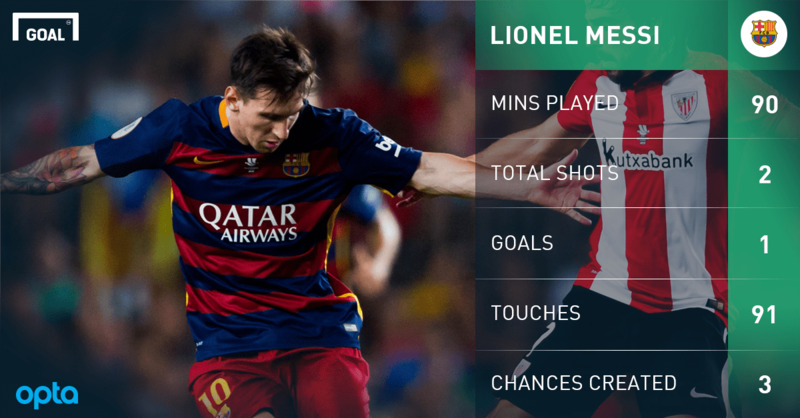 Athletic had done their homework. Less effective without Neymar alongside to drag defenders away from him, Messi still provided the moment of inspiration that made Barca believe when he scored just before half-time. Psychologically, it was an ideal time to strike and set up a a grandstand second half. That soon fell flat, however, as Gerard Pique was harshly sent off for angrily protesting what looked like an incorrect offside call. Even after that, chances came and went for Barca as Ivan Rakitic kneed the ball wide at the far post when it seemed easier to score and Andres Iniesta also failed to hit the target from close range. 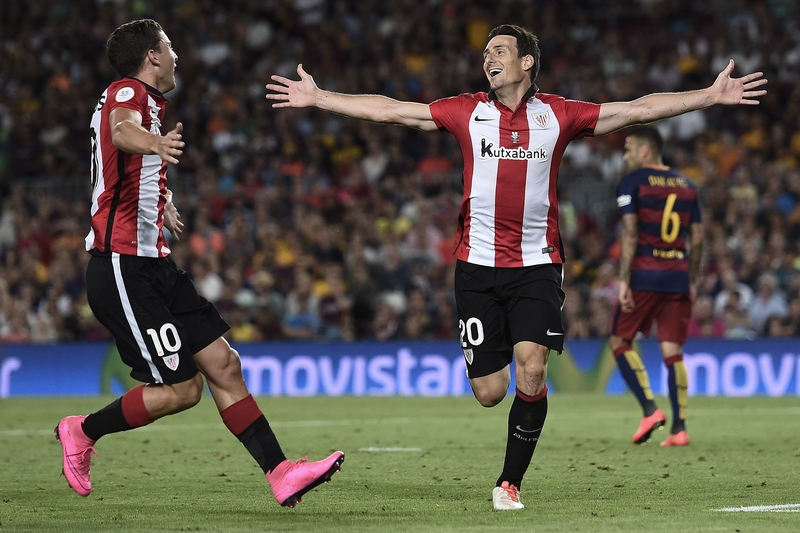 And at the other end, Aritz Aduriz then hit home at the second time of asking to net his fourth in the tie and seal a first trophy in 31 years for Athletic. 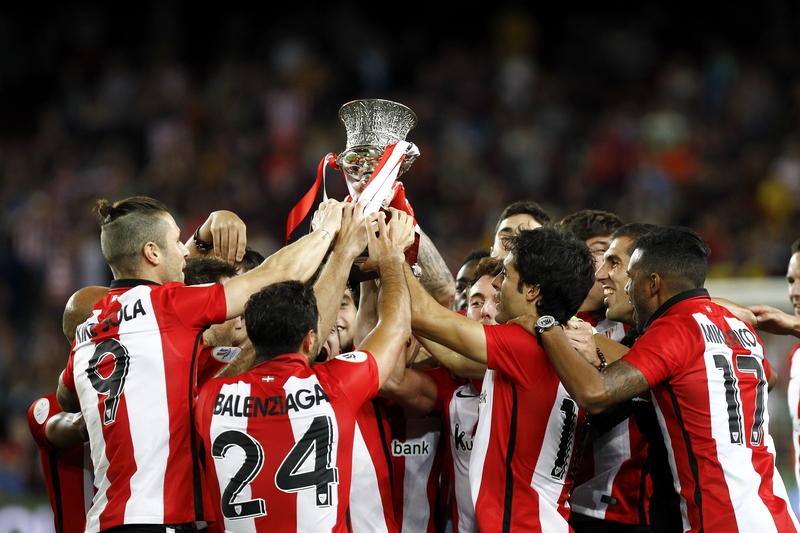 The Basque outfit have been waiting ever since 1984, when they claimed La Liga and the Copa del Rey in the same season. 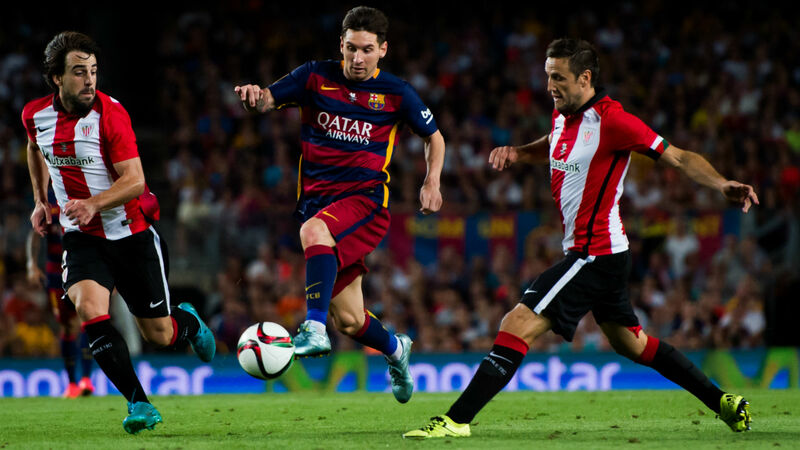 The winners of those two competitions qualify for the Spanish Supercopa, but as Barca won them both in 2014-15, the Leones made it through by default. Nevertheless, they deserved to win this tie over two legs – and the damage was done for Barca in Bilbao. Luis Enrique’s rotations ended up costing his side at San Mames and, even though they had a good go on Monday, it was always going to be a tough ask. The Asturian coach had claimed after the loss in Bilbao that he would pick the same side again if he could, but surely there is some regret at his choices for Friday’s game. Either way, there is work to be done. Pique looked excellent while he was on the pitch, but Jeremy Mathieu was woeful on his return to the team at the back, Dani Alves may as well still be on holiday and the continued absence of both Neymar and Jordi Alba remains a concern for the coach. Pedro, meanwhile, is expected to leave in the coming days and new signings Arda Turan and Aleix Vidal are unable to feature until January due to the transfer ban. 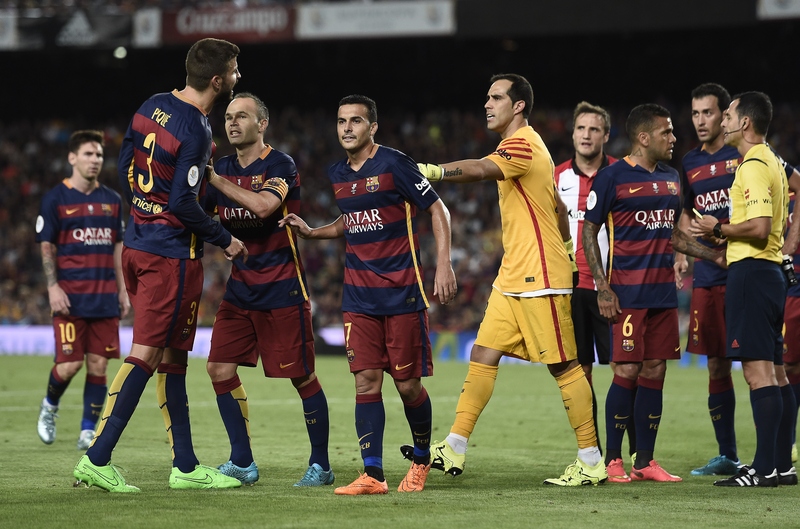 Barca now have six days off ahead of their opener in La Liga against Athletic again on Sunday. So time for some rest and also for a little revenge as the Catalans return to San Mames, scene of their painful defeat on Friday, with Luis Enrique already facing question marks after missing out on a fifth title. Unable to emulate former coach Pep Guardiola’s six trophies in 2009, Luis Enrique now needs some quick fixes after his team conceded nine goals in their last three matches. For the 45-year-old, the hard work starts all over again.